The UAE Ministry of Foreign Affairs and International Cooperation (MoFAIC) and the Secretariat of Foreign Affairs of Mexico have traded a political communication of understanding (MoU) on visa exception whereby citizens with regular passports of both countries will be allowed visa-free entry. 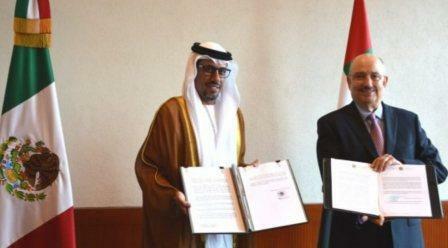 Ahmed Hatem Al Menhali, UAE Ambassador to Mexico, offered the tactful MoU delivered by MoFAIC to Carlos de Icaza, Mexican Under-Secretary of Ministry of Foreign Affairs, under the command of Luis Videgaray Caso, Secretary of Foreign Affairs of Mexico, while Al Menhali received the MoU from de Icaza delivered by the Mexican Foreign Ministry. Al Menhali acclaimed the historic juncture and labeled it as the highest of their penetrating mutual exertions while observing its compensations. He also thanked the Mexican authorities, who donated to its success. De Icaza thanked Al Menhali on behalf of the Mexican Government and congratulated the UAE's wise leadership while wishing them further development and wealth. The ritual was attended by senior officials and members of legal and consular administrations.